A. From Server Manager on Server2, install the Application Server server role. B. From the Configuration Manager console, add Server2 as a distribution point. C. From Server Manager on Server2, install the Windows Internal Database feature. D. From the Configuration Manager console, enable PXE support for clients. Your network contains an Active Directory domain named contoso.com. The domain has Microsoft System Center 2012 Configuration Manager installed. You need to ensure that you can modify boot images by using the Configuration Manager console. What should you do? A. Create a custom task sequence. B. Install the Windows Automated Installation Kit (Windows AIK). D. Create a deployment package. Whatsoever, ADK is not an answer option here and AIK is not supported. We could modify the boot image properties in console, but that is not an option too. I think the best answer choice would be MDT, it will allow us to modify / create a boot image. If you'll get the answer option ADK - I think that would be right, as it is the prerequisite for the proper boot image architecture. - Minimize the amount of bandwidth used by Remote Desktop sessions. - Minimize the amount of hardware resources used by the RDS servers. 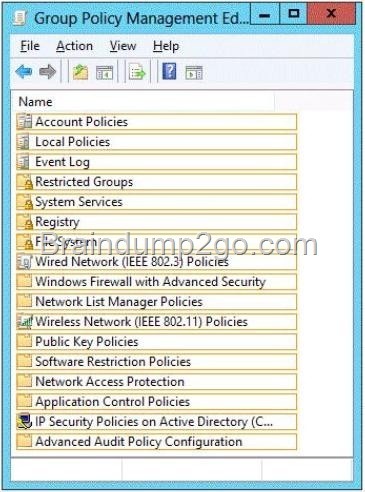 A group policy that limits screen resolution settings will save the most bandwidth / and memory. GPO (C) Configure RemoteFX lossless graphics data does not exist. GPO (D) Configuring the RDP compression will increase performance, but has a tradeoff - though there is a balanced setting, it will burn more memory, maybe even cpu cycles. Your network contains two Remote Desktop Services (RDS) session collections named Collection 1 and Collection2. Each user has a laptop computer that runs Windows 8. The users frequently log on to sessions in Collection1 and Collection2. - Ensure that the user profiles remain the same when the users log on to their laptop computer and virtual desktop. - Minimize the time required to log on. Roaming User Profiles redirects user profiles to a file share so that users receive the same operating system and application settings on multiple computers. When a user signs in to a computer by using an account that is set up with a file share as the profile path, the user's profile is downloaded to the local computer and merged with the local profile (if present). When the user signs out of the computer, the local copy of their profile, including any changes, is merged with the server copy of the profile. Roaming User Profiles is typically enabled on domain accounts by a network administrator. Folder Redirection enables users and administrators to redirect the path of a known folder to a new location, manually or by using Group Policy. The new location can be a folder on the local computer or a directory on a file share. Users interact with files in the redirected folder as if it still existed on the local drive. For example, you can redirect the Documents folder, which is usually stored on a local drive, to a network location. The files in the folder are then available to the user from any computer on the network. Your network contains an Active Directory domain named contoso.com. The domain contains a server named Server1 that runs Windows Server 2012. Server1 has the Active Directory Certificate Services server role installed and is configured as an enterprise root certification authority (CA). You plan to implement Encrypting File System (EFS) on all client computers. Users use different client computers. You need to prevent the users from receiving a different EFS certificate on each client computer. What should you implement? This may use up extensive space in Active Directory. 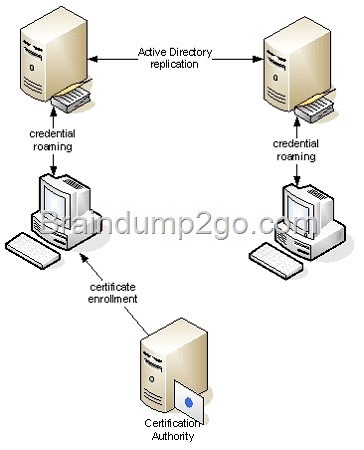 A certificate is enrolled to a computer where a user is logged on interactively. With credential roaming, the certificate and also the corresponding key pair are uploaded into the user's object in Active Directory about 10 seconds after certificate enrollment. If the domain consists of multiple domain controllers, Active Directory replication will make the updated user object available to all other domain controllers within the domain. If the same user who was previously enrolled for a certificate logs on to a different computer or terminal server session, credential roaming will synchronize the user's local certificate store with the certificates that are stored in Active Directory. Your network contains an Active Directory domain named contoso.com. Domain controllers run either Windows Server 2008 R2 or Windows Server 2012. All client computers run Windows 8. Each user has a laptop computer. You enable Folder Redirection and you configure the Redirect folders on primary computers only Group Policy setting. You need to ensure that user folders are redirected only when the users log on to their personal laptop computer. What should you modify? Your network contains a Virtual Desktop Infrastructure (VDI). You plan to deploy an application named App1 to the virtual desktops. App1 requires a minimum display resolution of 1280 x 1024 You need to identify the maximum number of virtual displays that each virtual desktop can use when running Appl. How many virtual displays should you identify? Your network contains an Active Directory domain named contoso.com. A Group Policy object (GPO) named LaptopSecurity is linked to an organizational unit (OU) named Laptops. A corporate policy states that users who use a laptop computer are forbidden from using removable media. You configure LaptopSecurity to prevent the users from installing removable devices on their laptop. A user named User1 cannot install removable devices. However, User1 can read and execute applications from a removable device that the user used before you configured the GPO. You need to ensure that the users cannot access any removable devices, even if the driver for the removable media was installed already on their laptop. Which Removable Storage Access setting should you modify? Your network contains an Active Directory domain named contoso.com. You plan to implement Encrypting File System (EFS) to encrypt data on the client computer of each user. You need to prevent EFS from generating self-signed certificates. 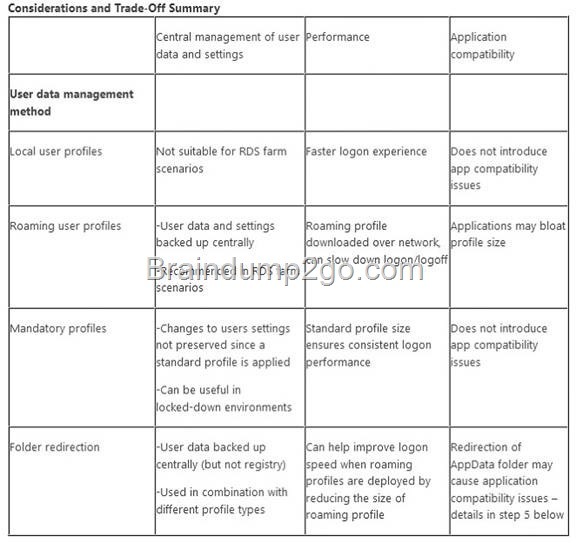 What should you use in Group Policy Management Editor?